Fact 1: Melbourne native Lola Berry lost 20 kilos in 20 weeks. Fact 2: This spurred her on to blog, film and write about the simple dietary adjustments – think unprocessed foods, no grains, dairy and refined sugar – that got her there. Lucky you, as it's now all in her book, The 20/20 Diet, and the follow up cookbook. As colourful and all consuming as the delightful dishes within, here Lola serves up her top health tips, mate-date venue and performers to watch. TUL: What's the story of Lola Berry? I was real unhealthy, being a DJ and partying like there was no tomorrow. Then I went on a summertime detox and felt great, became really fascinated with wholefoods and decided I'd love to be the Steve Irwin of fruits and veggie. I invested in a camera, and dove in. From that, the webisodes were created, which led to TV, and the TV led to books and travelling and filming all over the world! I feel really blessed! TUL: How has food changed your life? I am my most vital and I love myself when I'm at my healthiest because I know I'm the very best version of me. I love the medium of filming to spread an inspiring message that really makes my heart sing. That's when I'm in flow and everything becomes timeless. TUL: If you weren't doing this, what would you be doing? TUL: What are your tips to staying healthy as we head out of summer? Listen to your body. It knows so much but we need to tune into it way more; so listen to how you feel after meals for it to tell you what works and what doesn't. Get more sleep, aiming for eight hours. Every hour before midnight is equivalent to two hours thereafter, so the earlier the better! Buy some fresh blooms and give them to a stranger, along with a huge smile! TUL: Best way to spend $500…? Raw chocolate. My favorite brand is a Melbourne-based company called Liefje Chocolate. Life changing stuff! TUL: Favourite Australian fashion label? Lady Petrova is ace. I also love Friend of Mine and Bared Footwear and for bling I love crystals from Aletheia and Phos. Go for a nature walk. Biophilia is the healing power of mother nature, so hanging out in nature. TUL: What's 2014 hold for Lola Berry? Living the dream! 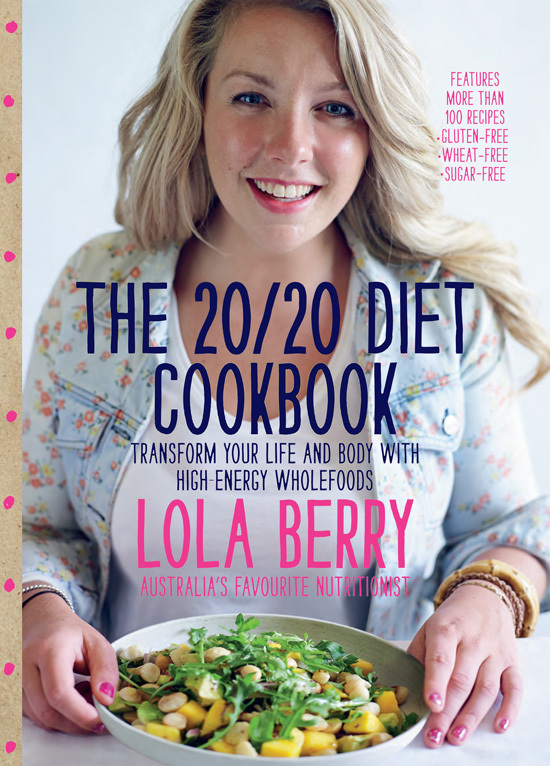 New book The 20/20 Diet Cookbook and helping as many souls as I can… So long as I'm living my truth then I'm rapt! TUL Note: With a mag & online writing career that has spanned nearly two decades and various local & global time-zones, Emma is happiest tapping away from her hometown of Melbourne. Now with her Urban List hat firmly atop her well-shampooed and styled noggin (perks of the job), she will not rest until she has served up every smokin' style sensation, beauty breakthrough and fitness destination this fair city has to offer. Image Credits: Lola Berry - Mel Tjoeng. Book Cover - John Laurie.